Thursday 7th March 2013 – 9.20am – Chris Kowalik. One thousand pounds has been donated to a group of volunteer lifesavers in Shropshire. 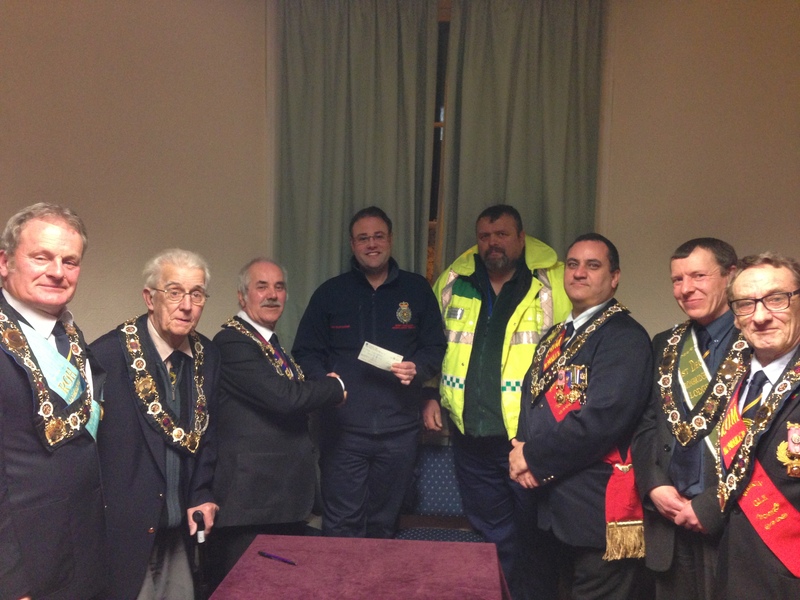 Telford & Wrekin Community First Responder (CFR) scheme, a registered charity (charity number 1131479) was presented with a cheque from the Ironbridge Lodge in Broseley on Monday 4th March. There are 23 active members of the Telford & Wrekin scheme, all trained by West Midlands Ambulance Service to a nationally recognised standard in a variety of skills and techniques including basic life support, CPR and defibrillation. They can be sent by the ambulance service’s control room to medical emergencies in their area while an ambulance resource is en-route. For more information about the work of Community First Responders, visit www.wmas.nhs.uk and enter “Community First Responder” in the search field.